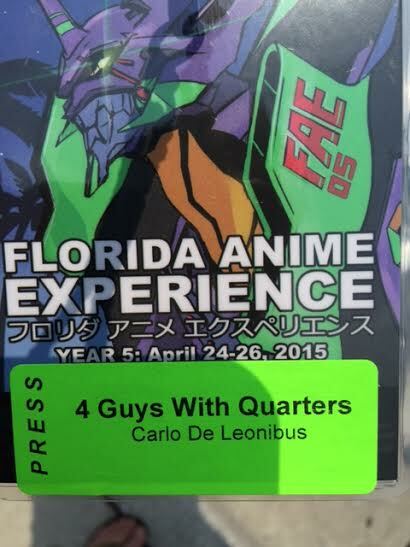 Home Blog Florida Anime Experience! Can I just say, Wow! I attended the Florida Anime Experience in Orlando and was truly amazed at the attention to detail and dedication that was clearly put into the event. There was so much to see its hard to know where to start: from truly committed cosplayers, interactive and eclectic booths, and plenty of friendly faces both in the form of attendees and event staff. I have to admit I am brand new to the genre but did not feel any of the awkwardness that “newbies” tend to worry themselves over. Luckily I had my good friend Cody from Nerdomnia.com to fill me in and catch me up on all things Anime before hitting the convention. The first thing I did to try and get a good idea of what to expect was pull up the handy GuideBook app on iOS. You would not believe the amount of incredible events that were available to take part in. Of course there were tons of vendors selling everything from original works of art to accessories, a spelling bee, a game room, the always coveted Q&A panel (featuring the American voice actors of Evangelion), and of course fan favorites in the form of pictures and autographs. I have to say the event was organized well and the staff were informative and extremely approachable. As a first timer to this event I of course found myself asking the occasional question to different members of the staff and always got useful and accommodating answers. When I first entered the event, I couldn’t take my eyes off of the vendors and colorful and creative cosplayer outfits. The room was overflowing with artwork, fresh ideas, and a certain air of dedication. It was evident that these people were committed to their characters not only through their impeccable tailoring and attention to detail, but also to their ability to immerse themselves completely in the actions and behaviors of the persona they were portraying. The vendors were not to be outdone however, and had eye-popping displays that could give many of the cosplayers a run for their money. Seeing all of this unfold before me and many others made me want to truly understand anime and embrace its culture. Once I was able to regain focus, the very next thing I did was walk into the game room and I found myself sitting in front of a Super Famicom! As being a founding member and regular contributor to a video game podcast and website you all know how much this meant not just to me but to all of us at 4 Guys with Quarters! For the Florida Anime Experience to have one on display that was actually interactive and could be playable was jaw-dropping to say the least. 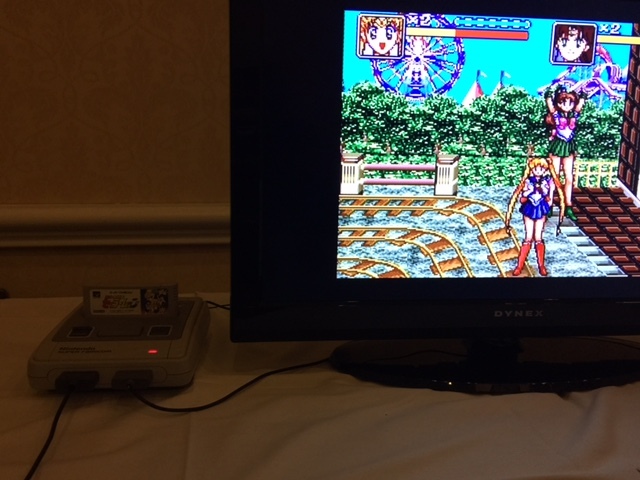 I got to play Sailor Moon in Japanese and it felt very similar to Final Fight or Streets of Rage. It was definitely a lot of fun. Once 11:30 rolled around I went over to the Q&A panel that was hosting Brina Palencia, Spike Spencer, Tiffany Grant, and Trina Nishimura. I did get to ask one question that sparked the attention and interest of the panel, “How did you get discovered as voice actors?”. I got responses that met what I had previously expected. It was awesome to see Brina bust out with the stereotypical thought of you just sitting in a mall eating pizza and getting discovered, which clearly does not happen! Instead through hard work and dedication to the art of voice acting she was able to achieve success. 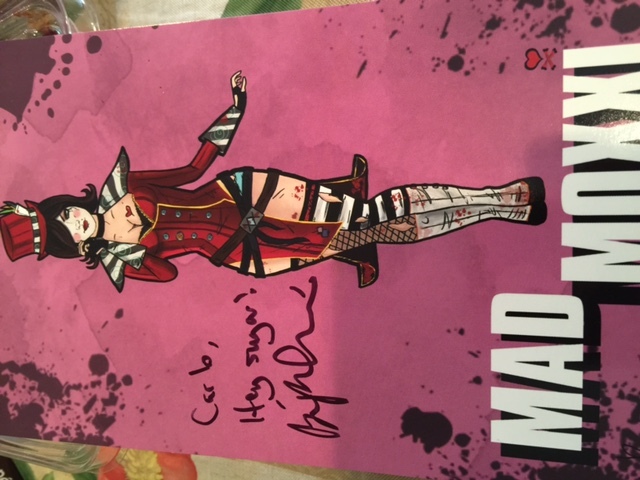 Oh, and for those of you who didn’t know, Brina Palencia did the voice of Max Moxxi for Borderlands! Spike Spencer contributed to many video games through voice acting as well. I could go on at lengths listing his acting credits but some of his most well known are Bioshock Inifinite, XCOM Declassified, and World of Warcraft. Tiffany Grant also added her talent to a couple of video games. Looking into the future I hope to see Trina Nishimura’s voice talent highlighted in some. All four guest speakers were truly mesmerizing in their conduct: very open with their fans, approachable, friendly, and genuinely seemed like they were having a great time being at Florida Anime Experience. I was able to browse through some of the vendors displays that were present and as usual wanted a lot of what I saw! I am new to Anime as I previously mentioned so I wasn’t able to identify or recognize all of the merchandise but I can tell you I still enjoyed it. The amount of detail and the level of artistry that goes into anime toys/figures stands alone and sets a high standard for all other merchandising attempts. The next time I go to the Florida Anime Experience I am going to be prepared to spend a lot more time and money! I recommend the Florida Anime Experience to any fan of the anime/manga/cosplay. I am marking down the days on my calendar to next years convention! Previous article4GwQPodcast – Ep 39: @krypto9095xbox joins the show for some #MortalKombatX talk and other news! 4 Guys with Quarters is your up to date news source on everything gaming! 4GwQ Presents: Interview with inZane Comics!